In 1891, Salvation Army Captain Joseph McFee was distraught because so many poor individuals in San Francisco were going hungry. During the holiday season, he resolved to provide a free Christmas dinner for the destitute and poverty-stricken. He only had one major hurdle to overcome -- funding the project. Where would the money come from, he wondered. He lay awake nights, worrying, thinking, praying about how he could find the funds to fulfill his commitment of feeding 1,000 of the city's poorest individuals on Christmas Day. As he pondered the issue, his thoughts drifted back to his sailor days in Liverpool, England. He remembered how at Stage Landing, where the boats came in, there was a large, iron kettle called "Simpson's Pot" into which passers-by tossed a coin or two to help the poor. The next day Captain McFee placed a similar pot at the Oakland Ferry Landing at the foot of Market Street. Beside the pot, he placed a sign that read, "Keep the Pot Boiling." He soon had the money to see that the needy people were properly fed at Christmas. Captain McFee's kettle idea launched a tradition that has spread not only throughout the United States, but all across the world. Kettles are now used in such distant lands as Korea, Japan, Chile and many European countries. 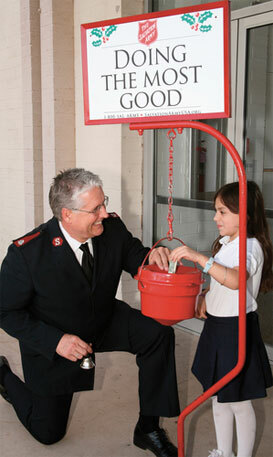 Everywhere, public contributions to Salvation Army kettles enable the organization to continue its year-round efforts at helping those who would otherwise be forgotten.